BOOK VIEWINGS ONLINE at Umega website! A fully renovated upper UNFURNISHED flat boasting 2 spacious double bedrooms and private back garden in the sought after area of Gorebridge south of Edinburgh. 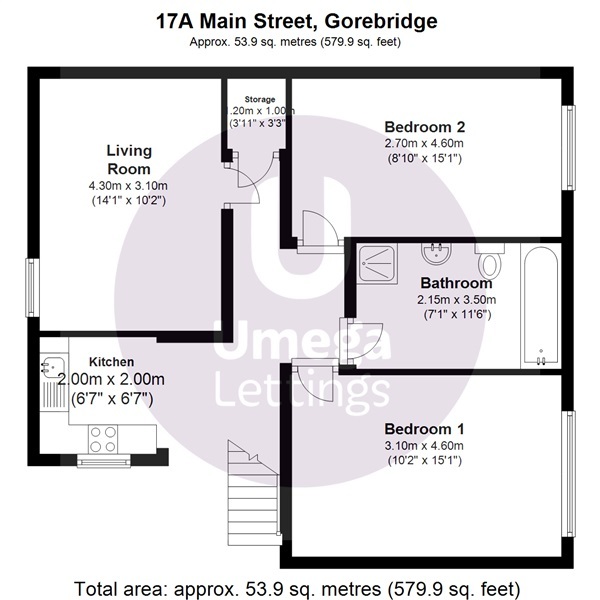 Located bang in middle of Gorebridge, this fully renovated property ticks all of the boxes. A spacious lounge to the rear of the property with a good sized kitchen. A spacious hallway leads to two large double bedrooms to the front of the property in addition to a modern family bathroom (separate bath and shower). A large back garden to the back of the property ideal for those sunny days spent with friends and family. Gas central heating and double glazing throughout. Ideal for leaving the hustle and bustle of Edinburgh behind after a day's work and enjoying the quietness of Gorebridge. Much sought-after with much to offer in the shape of local amenities with McColl's a few metres down the road, a local post office, a pharmacy and frequent access to Edinburgh by train (Gorebridge train station just round the corner) . A must see! EPC rating: C. Landlord Registration Number: 282759/290/12391.